Posted April 1, 2018 by The Rapid & filed under Places to Go. April is here! 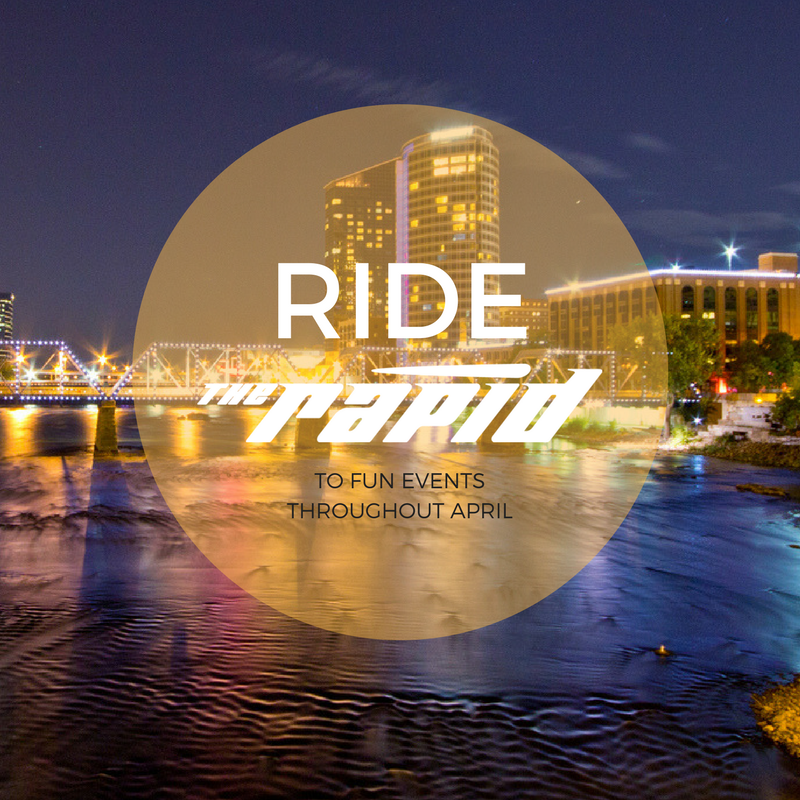 Ride with us to these events throughout Grand Rapids and the suburbs. Spend your spring break at John Ball Zoo! From April 2-6, enjoy a week filled with animal demonstrations, games, arts and crafts, and more. View admission prices here. Route 12 and 50 can get you to John Ball Zoo. Calling all coffee lovers! This is the crawl for you. From April 5-8, explore local coffee shops and try different blends of coffee, tea or hot chocolate, all while benefiting the Heartside Gleaning Initiative. General tickets for this event are $15 and just $12 for students. All of the coffee shops are located within our bus service area. Get your ticket here. Routes 1, 2, 3, 4, 5 + can get you there. Do you have animal lovers in your family? Ride Route 9 to the DeltaPlex Arena on April 7-8. The West Michigan Pet Expo will feature pet-related vendors, rescue organizations, pet meet-and-greets and fundraising activities! There will even be live events. Route 9 can get you a short walk from the DeltaPlex! The Grand Rapids Latin American Film Festival is returning for its eighth season from April 6-8 at Wealthy Theatre. This 3-day festival will feature 9 recent films from Argentina, Brazil, Chile, Colombia, Mexico, Paraguay and Venezuela. Many of the films will also feature question-and-answer sessions with directors and a panel discussion with special guests. This festival is free to the public and all films will be presented with English subtitles. See the film schedule and learn more here. Route 5 can get you there. This festival brings quality entertainment and transformative films to our community! This 3-day celebration kicks off with a signature event featuring short films at The Waldron on Ionia with the following day featuring a variety of films at Wealthy Street and a final day of storytelling about the power of film. Prices vary for each event. View the full event schedule and learn more here. On April 20, ride The Rapid to Grandville for the Art & Chocolate Walk! This event is a great opportunity to explore Downtown Grandville with more than 20 venues displaying art and chocolate and beverage tasting stations. There will also be musical performances from Grandville Students, chalk artists, swing dancing and more! There will be $3 Sips & Bits cards available for purchase the night of and the week before at Grandville City Hall. One card per person = a sample chocolate or beverage at each of the 20 art locations. $1 from every card purchased goes to the Grandville Education Foundation. Route 8, 24 and 28 can get you to Grandville! On April 21, celebrate Earth Day at Blandford Nature Center from 12 p.m. – 3 p.m. Ride Route 7 to explore all that Blandford has to offer for free! This Celebrate the innovative exhibition, Color of the Year presented by Pantone and X-Rite, with an opening reception on April 6 at the UICA. Stroll the galleries and explore the works on view inspired by the 2018 PANTONE® Color of the Year, meet and mingle with the artists, and enjoy small bites from Reserve Wine and Food, Mokaya, The Cakabakery and a cash bar. Enjoy music by DJ Romy Glazer and complimentary Ultra Violet-inspired makeup and nails by Coiffeteria Salon. Fresh floral designs by A Growing Frenzy will also be view during the lively event. This exhibit will run through July. Routes 1, 4, 14, 13, 14 and 15 can get you to the UICA. Play, learn and explore on April 28 from 9 a.m. – 12 p.m.! This free event takes place at Kent Career Technical Center. Bring your children to take part in fun activities, as well as access to many valuable programs, resources and organizations. There will be an onsite signup for free preschool, free vision and hearing screenings for toddlers and a range of early childhood information. This FREE event includes fun activities for families and children as well as access to many valuable programs, resources, and organizations. Ride Route 15 to get to the Kent Career Technical Center.